November | 2012 | "Not Now, Honey. Mommy Has to Blog." When I was a junior in college, I was just about an hour away at the University of NH. I had my car at school, so one Friday afternoon, I came home for the weekend. As I came through the garage door into the basement, dirty laundry in tow, I heard the familiar booming voice of my dad. Judging by the charismatic, yet polite, tone of his voice, it soon became obvious he was on the phone. So, I sat down on the couch behind him and listened to his end of the call, while soaking in the familiar sights and sounds of my childhood home. I assumed it must be an old friend or work associate, judging by his warm and encouraging words. A minute later, the receiver to his ear, my dad turned around and spotted me. His eyes flashed open wide and a huge smile crept upon his face. He held up his index finger as if to say he was about to finish up the call, and I nodded. He hung up the phone and he walked over to me and threw his arms around me in a big bear hug. “Hi Dad!” I said! “Hi, my darling!” he exclaimed. He looked at me blankly for a minute as if trying to register my question. Today, we are all here to tip our hat to a wonderful man. A man who has had a profound influence on all who knew him. Together, we toast the man, the myth, the legend of Ed Dugan. For one of his great gifts, was making people laugh. He had many jokes, anecdotes and one-liners that he employed year…after year…after year. In fact, he was so fond of joking around, that early on in our family, we learned the necessity of employing a very simple rule to be able to tell when my dad was kidding, or when he was telling the truth. If he said something that seemed hard to believe (which was pretty often), we’d say, “Honest, Dad?” And if he was joking, he had to confess right then and there. If he replied back with “Yes, HONEST!” then we knew it was the absolute truth. Such was the way of my childhood. My dad had a great love for people. Whether stranger or beloved friend. He loved nothing more than making people laugh or paying them a compliment. To all his daughters, he would say, “You’re beautiful!” at just about every chance he’d get. And as for my mom – well, he would often gaze at her as if it were the first time he had ever laid eyes on her. My dad would smile as she walked away, pleased with earning yet another loyal customer. The Shirleys of the world loved my dad. My father was in sales all his life; a profession that took him all over the country travelling while my mother dutifully raised the kids. He learned early on that the key to getting a customer’s loyalty was to become invested in them on a personal level. But this natural curiosity extended far beyond his business life and became his own personal mantra wherever he went. You could always hear him striking up conversations with anyone who would listen. At church, at the supermarket, in the waiting room of a doctor’s office. You know that rule about people not speaking in elevators? Well, that didn’t apply to my dad. I think some of his best friendships were born in elevator cars. He loved to know what made people tick. What they did for a profession. If he knew someone was a mechanic, for example, he’d ask, “So John, just how did you get into the business of fixing cars?” For, he knew people LOVED to talk about themselves and when they would tell their tale, my dad would fix his eyes on them as if what they had to say was the most important thing in the world he ever heard. And he also learned the art of how to disarm a difficult or disgruntled customer with his charm and his grace. One day, I remember my dad came home after getting a speeding ticket. He was known to have a bit of a lead foot, so this wasn’t terribly unexpected. My dad recounted the story of when the officer pulled him over. As he got out of his patrol car, and walked over to my dad, he was red-faced and angry, demanding to know if my father had any idea how fast he was going! The officer was extremely scolding in his tone and was obviously very displeased with my father’s lack of rule-following on the road. He looked at my dad, slightly confused. The officer, at a loss for words, hastily took the rather pricey ticket from his pad, handed it to my father and walked away. My dad drove off and eventually made his way home. My dad thanked him profusely, and hung up the phone, absolutely glowing. Like any proud parent out there, my dad loved nothing better than receiving a compliment about his children. And he loved sharing those compliments. The only catch was, in order to get my dad to tell us the compliment, WE had to tell my dad a compliment that we heard about HIM first. He called these “TL’s” which stood for “Tell Last”. This meant that he would tell us the compliment last – only after we spilled the beans about something nice we heard about him. Bottom line, my dad loved to hear praise in any form. Perhaps the greatest lesson my dad ever gave to us, was the love he had for my mother. All my life, he has only seemed completely at peace when she was by his side. Even when I was a young girl, when he would be watching TV, I’d walk into the room and he’d say, “Where’s your mother?” when she was only feet away in the kitchen. My parents were a team. They went to the grocery store together. They went to the gas station together. They were pretty much inseparable. He adored my mother and longed to be with her all the time. Their love story was epic. In the twilight of his life, my dad began his slow-dance with dementia. 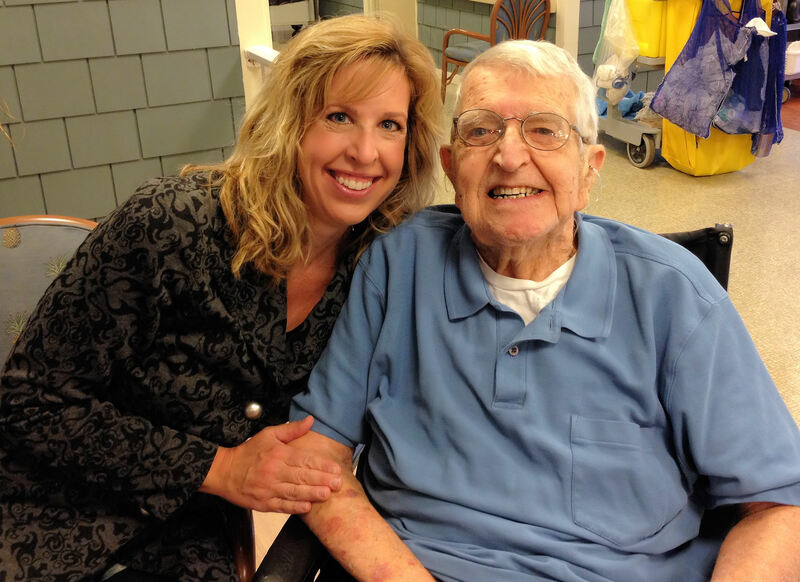 He did so gracefully, and sweetly – always with a smile on his face and a compliment to a nurse or staff member. The one thing I will truly miss about my dad was the way he told his family that he loved us, every time he saw us. I’ll miss his blue eyes twinkling when I came into his range of view, and the way his face captured his joy when he saw my face. He’d say, “Hi, my Darling!” as he seemed to convey with every cell of his body how happy he was to see me. When we would part, I’d say, “Okay, dad – I have to go. But I’ll come visit you tomorrow!” Then like clockwork, he would take my hand, bring it up to his lips and softly kiss it. It was his signature send-off. I’m going to miss that very much. He was a simple man. At times, he was a complicated man. But always, he was a loving man. Though his death won’t make the evening news, nor will an article on his passing grace the pages of his beloved “People Magazine,” the story of his life is no less important or extraordinary. For he was larger-than-life to this daughter, a legend in his own time, and not someone I can ever possibly forget. I will miss him deeply, and today our family’s grief is great. But my faith tells me I will see my dad again, a belief that today I cling to. And as my nephew Brendan pointed out to me just the other day, our faith tells us that today, he is more alive than ever before on earth. Until then, I will proudly make small talk to strangers in elevators, pay random compliments to waitresses and people at grocery stores, in his honor. I will never miss an opportunity to make someone smile with a corny joke. I will cherish my family, and tell the people I love how much they mean to me, all in loving tribute to him. I love you, dad. And I’ll miss you forever.